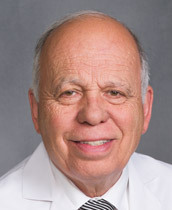 The Indianapolis, Indiana, native joined Johnson City Internal Medicine in 1977. Holding over 38 years of experience, Dr. Brown received his medical degree from the Medical College of Virginia, Richmond, after earning his B.A. from Emory and Henry College. Before coming to JCIM, he served as a U.S. Army Major, Chief of Medicine. His professional memberships are numerous including the American Medical Association and the Tennessee State Medical Association. He holds the distinct honor of MD of the Year Award in 1987 from the Organization of Mass Emergency for Fire/Smoke/Exposure Victims. Dr. Brown is married, the father of four, and the grandfather of five.